This machine has a well traveled look to it. This picture makes me chuckle. 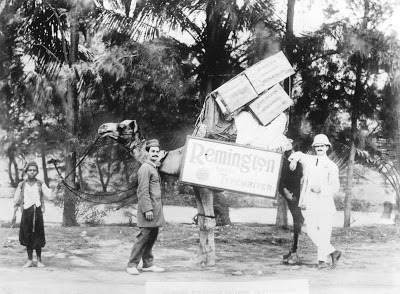 Transporting typewriters by camel. Sears Citation 2 is my weapon of choice, 'cause you know I love my Smith Coronas. 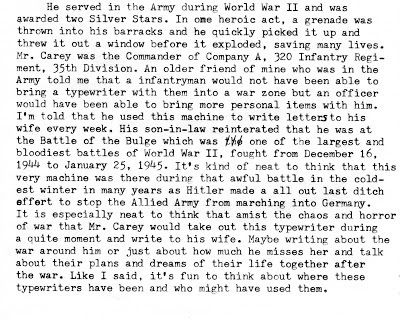 The story behind Mr. Carey's typewriter certainly adds depth and meaning to the object. 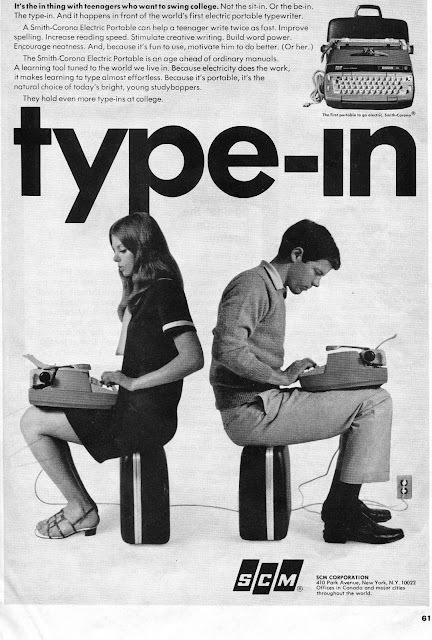 I didn't know that the term "type-in" was coined in the '60s. Keep safe in the blizzard, and I look forward to the CNN video. Thanks for another very interesting update. Thanks Richard. That's kind of cool that they said type-in almost fifty years ago. Time to go back out and shovel! Tom, thanks for this update, always a good read. I know you'll keep busy with the repairs and keep the creativity going through the blizzard. Be safe! 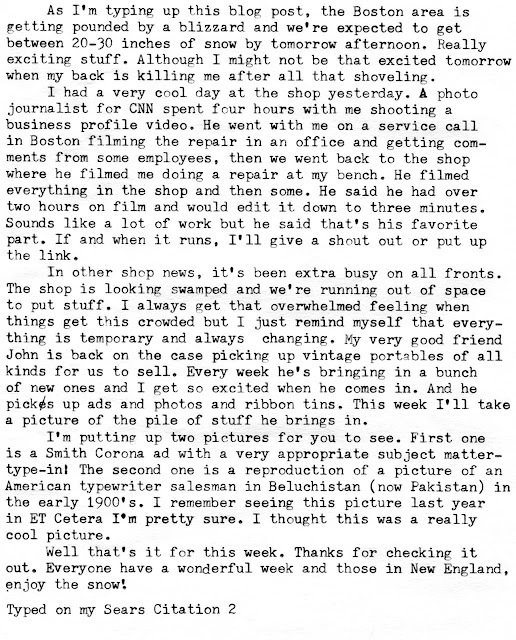 The Battle of the Bulge back story is precious. 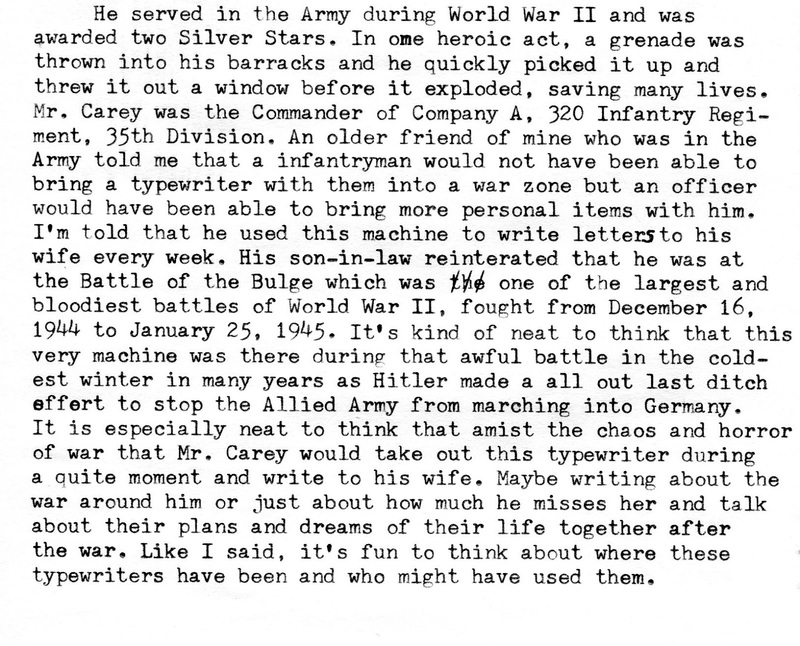 Typewriters are custodians of memory indeed. The "Type-in" ad says "It's the in thing with teenagers..." and that was in the 60's??? And I've always presumed that the typosphere invented that term. We are way too late! The CNN video is great news, congratulations! Do let us know when it's going to be shown. I still remember how much I enjoyed your short film last year so I'm really excited to see this one. Ton- Glad you enjoyed the story. I wish I'd get more of these great stories with the machines that come through here. Isn't that a hoot about the type-in ad. I guess everything's retro. Thanks! I always love the fascinating backstories that come with a machine that has been in a family for a long time. Thanks for telling us about this one. Right now, it's sunny and in the 60s here in Birmingham, AL. Time, I think, to go out on the patio for some typing. Peter- Glad you liked the story. And thanks for rubbing in the nice weather your having. I think I'll make some hot chocolate and huddle by the fireplace. thanks!. I hate to spoil a good blizzard, but it was a nice and not humid 85 deg. F here today. Nice weather for shorts and a t-shirt. I really miss the snow. I think the first year I moved to VA we had a Noreaster and I ended the storm with 34" of snow on my back deck. 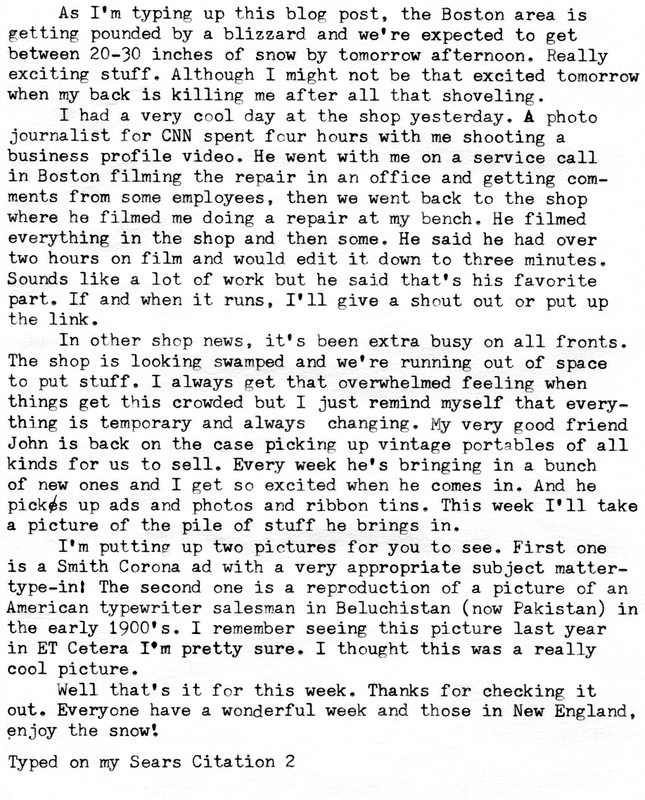 There was always more snow in VA than where I lived in central PA.
That is a great story to go along with the Smith-Corona. 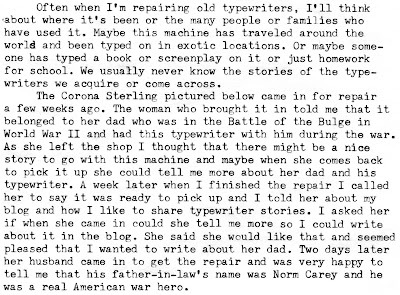 I always enjoy your stories behind many of the typewriters you post. What is the date of the Type-in ad. Seems like it should be around 68 or 69. If it is 40 years later we still have type-ins. Congratulations on the CNN video. I look forward to seeing it. Will you receive a copy of the entire shoot? I think the ad is from '67 after a bit of googling. They ran a whole series featuring the "studyboppers." 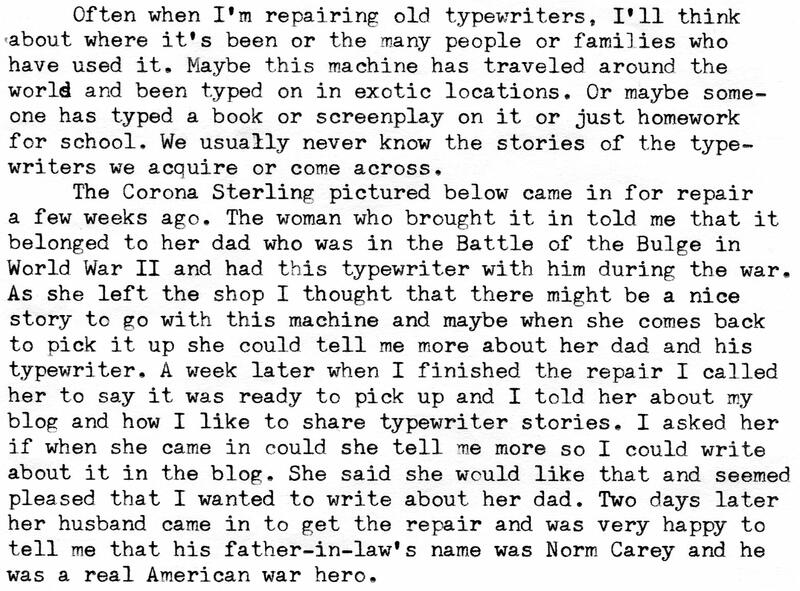 The stories behind many of these machines, is one of my favorite parts of these Typewriters. Thanks for looking into this, and sharing. Beautiful! You folks in Boston really got pounded by this storm! I sincerely hope that you are doing OK in the middle of it all. That 60s ad with the two electric typewriters on the students' laps really made me think: "Those typewriters are NOT exactly lightweight!" It would be rather torturous to type with one of those things in your lap. The two youngsters in the type-in ad are - let's face it - a bit too square to do an anything-in. They're just not hip, is all I'm saying. Thanks for sharing: what a fun ad! Bill- Glad you remember how much fun a good blizzard is. They said 25" here but we had 4' drifts around the house and cars. I love how the world comes to a screeching halt with that much snow. It's a special time. I don't know if I'll get a copy of the video but I'll give a shout-out when it's going to show. thanks. Richard- Thanks for checking on the SCM ad! Sounds right. Scott- Glad you enjoy the stories. They're second hand stories (sometimes third hand) when I hear them in the shop and I still get goosebumps. Thanks! Cameron- We not only survived the storm but are having a blast. The world comes to a stop for a few days and you can really relax and appreciate mother nature. You must get that in the mountains all the time. Those machines are pretty heavy, the carriage return would be uncomfortable. Thanks. Duffy Moon- thanks for sharing too!. I agree about the students. I don't think they were making the Summer of Love scene in San Francisco in '67.